The Munich is beautifully balanced between malty caramel sweetness and roasted burnt bitterness. The aromatics are reminiscent of a dark Earl Gray tea. Despite its robust flavor profile, the high quality barley has maintained an enzyme and extract package more reminiscent of a base malt. Jim Flath of Rahan farms is also a senior operator having been in a long-term partnership with Elmer. Their unique partnership style focusing on agronomics over individual ownership has been featured in the Western Producer and been adopted by many others groups since. Jim has been involved in 40+ harvest all of them alongside his father Bob who still helps out in a meaningful way in his mid-80’s. Jim like the rest of the team is a University of Saskatchewan alumnus. While being available for the busy times of seeding and harvest, he currently works off the farm for CIBC Wood Gundy as a financial advisor and brings a well-rounded skill set and market knowledge to the team. Maker’s Vienna is made from premium 2-row Copeland barley. The 2018 Vintage was grown on “Horseshoe Bend” one mile from the Malt House in Rosthern, Saskatchewan. Maker’s Pale is commercially available in 25 kg bags. It is also now available in smaller 10lb and 2lb bags specifically for our homebrewers! Maker’s Munich is ideal for darker ales, lagers, and bocks. We push the envelope with our distinctive kilning recipe as the premium barley used by Maker’s holds up to the heat retaining solid enzyme activity for its SRM. The kilning will add robust malty flavor and golden orange tones. Usage rates up to 50% or more may be considered. Each batch of Maker’s malt conforms with our “Single-Malt” philosophy. It is a pure barley variety with no blending used to achieve specs. It is traceable back to the field where it was grown and the farmer that grew it. Each batch is then 3rd party tested by Hartwick College in NY to ensure quality and consistency before its release. 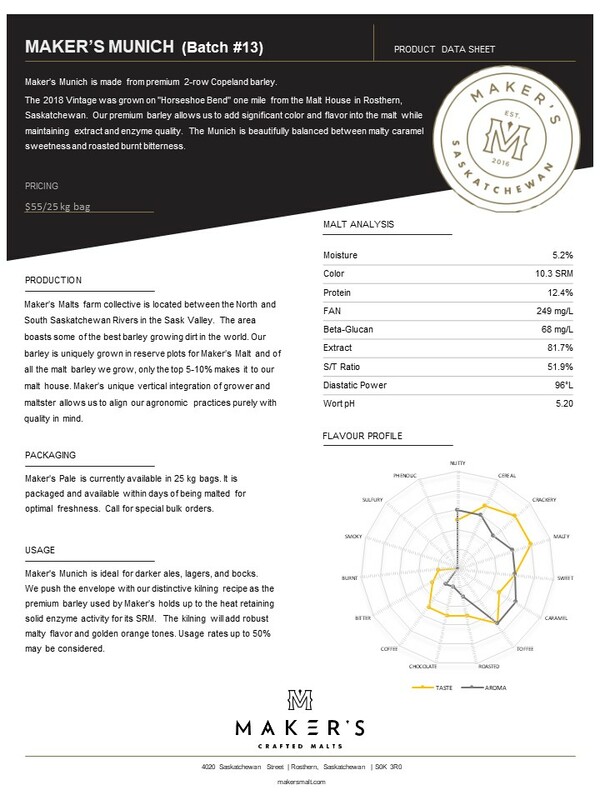 We provide a unique batch analysis sheet for every single batch ensuring you know exactly what is in your malt.